(21 The cycle of operation it broken down into eight steps. These steps are listed below« together with a brief description of what occurs inside the rifle during each step. fa) Firing. Firing occurs when the firing pin strikes the primer. As the trigger is pulled, the trigger lugs are disengaged from the hammer hooks and the hammer is released. 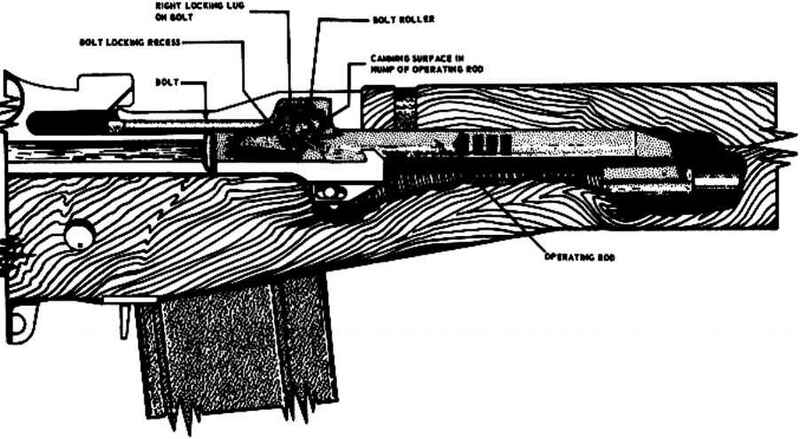 The hammer moves forward under pressure of the hammer spring and strikes the tang of the firing pin, driving the firing pin against the primer and firing the round Ifig 301. (b) Unlocking. 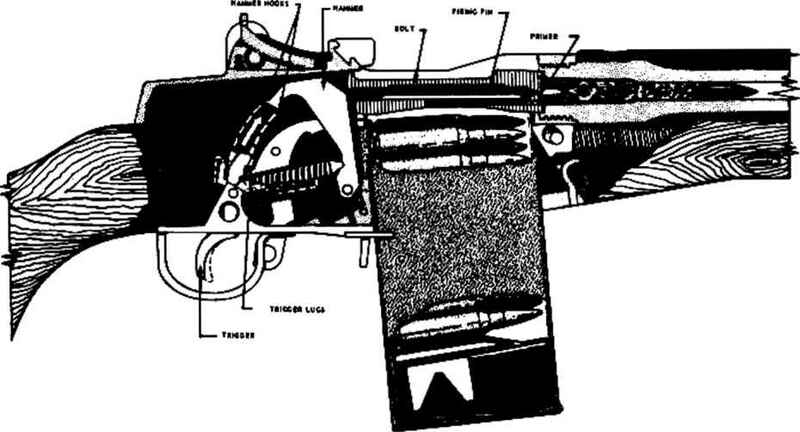 Unlocking (fig 31) occurs after the firing of the round. As the bullet is forced through the barrel by the expanding gases, a small amount of'gas enters the hollow gas piston, the gas cylinder and the gas cylinder plug through the gas port. The expanding gases force the gas cylinder piston to the rear. It in turn drives the operating rod and bolt rearward. The operating rod cams the bolt roller upward, disengaging the locking lugs on the bolt from the locking recesses in the receiver. At this time, the bolt is unlocked. fc) Extracting. Extracting is pulling the empty cartridge from the chamber. Slow initial extraction takes place as the bolt unlocks. 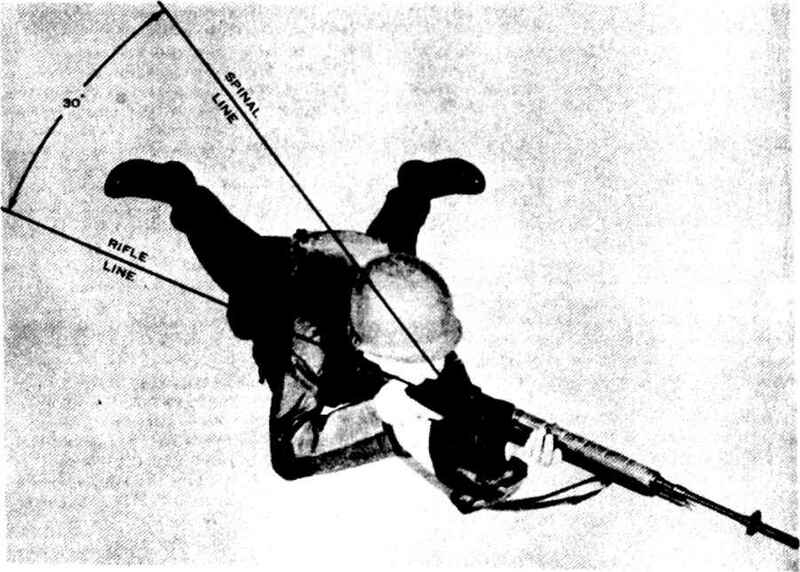 The bolt in its rearward motion pulls the empty cartridge with it (fig 331.
i<i) Ejecting. Ejecting is removing the empty cartridge from the receiver. As soon as the bolt has withdrawn the empty cartridge case clear of the chamber, the force of the ejector spring and plunger pushes the bottom edge of the cartridge base away from the bolt face, throwing it out and away from the receiver (fig 341. (e) Cocking. Cocking is positioning the hammer so that it is ready to fire the next round. The bolt, as it moves to the rear, forces the hammer down and rides over it. The hammer if caught by the sear if the trigger is held to the rear and by the trigger lugs if the trigger has been released (fig 34). In either case, the hammer is held in the cocked position. Figure 32. Positions of the spindle valve.